Stillbirth had been happening in human society with a constant rate. Stillbirth is the most indelible sad experience in pregnant women's life and also effects her family and friends in same tragic way. We hope to find biomarkers in mother blood to predict ailing foetus, before stillbirth actually occurs, so we can perform a caesarean section leading to a live birth. To see the rate of stillbirth decrease in society and to better understand the biochemistry of human ageing so that we can manage ageing clinically more efficiently. Dr Kaushik Maiti completed his master degree (MSc) in biochemistry in 1997 from University of Kalyani, India. He began working as a junior research fellow in The ICMR-virus Unit, Kolkata, gaining experience in ethnopharmacology and microbiology. He then joined the hormone research centre at Chonnam National University, South Korea, as a PhD student in 2000. Dr Maiti gained his PhD degree in molecular endocrinology in 2004. In his PhD he worked on gonadotropin releasing hormone (GnRH) and its G-protein coupled receptors (GPCR). He developed an antagonist for type-2 gonadotropin releasing hormone receptor. This can inhibit the growth of prostate cancer cells both in vitro and in vivo and thus have a great potential a therapeutic in treating prostate cancer. In 2006 he joined as postdoctoral fellow in Ohio State University, USA. During this time he gained experiences in estrogenic regulation of contraction of vascular smooth muscles. He has been working as Research Officer in Mother and Babies Research Centre (MBRC), University of Newcastle, Australia from 2007 to present. He is currently investigating ageing of placenta which can be linked to unexplained antepartum stillbirth. 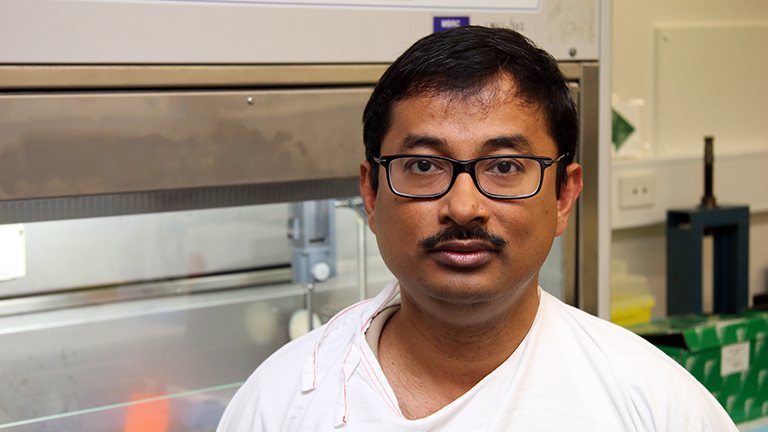 He is also trying to identify biomarkers in maternal blood to detect ailing foetuses. Dr Maiti has published several papers in peer reviewed journals: Journal of clinical endocrinology and metabolism, Endocrinology, Molecular endocrinology, Molecular pharmacology, Cancer Research, Nature Communications and more. He has presented his work at national and international scientific conferences. Google scholar stated that his work has been cited 440 times and he gained h-index of 12. He is currently supervising a doctoral student (50%). Globally, nearly 1% of all pregnancies end in stillbirth (3 million each year). The magnitude and gravity of stillbirth is such that in 2011 an entire Lancet series was devoted to it and urged a strong call to action, concluding that greater knowledge of causes is a key health priority. In Australia, stillbirth accounts for around 70% of all perinatal deaths (7 deaths per day) and is nearly 40 times more common than Sudden Infant Death Syndrome. Existing knowledge has had no impact on reducing the stillbirth rate, and a 2013 BMJ review of the UK data on stillbirth concluded ""preventive strategies need to focus on improving antenatal detection."